By 1 p.m. on Sept. 15, 2007, Steamers was already crowded with ragtime musicians and fans, unlike our previous meet, when both were in short supply until well after 1:30. Andrew Barrett got things rolling with his complex version of Charles L. Johnson's "Crazy Bone Rag," then the 1912 novelette "Rain Drops" by Charles B. Brown, a versatile ragtime-era composer whose music Andrew has been studying of late. Fellow teen Vincent Johnson delivered Les Copeland's "Twist and Twirl" and Eubie Blake's "Baltimore Todolo," both tricky and intricate numbers. The former was issued on piano roll and, more recently, transcribed by Tom Brier; the latter was composed around 1910 but remained unpublished until 1975. Vincent closed his set with a measured rendition of Scott's immortal "Grace and Beauty." Bob Pinsker gave us Rube Bloom's "Penthouse Romance," then launched into a dissection of the concept of swing and the evolution of its injection into pop music. To illustrate this, Bob gave us E.K. Bennett's "Banjo Rag" as it can be heard on the piece's 1909-era (pre-swing) piano roll. Noting that the craze for "barn dances" (or schottisches) dates to around 1908 and uses the dotted-note (swung) figuration, Bob then performed such a piece from 1908, "The Haymaker's Barn Dance" by W.C. Powell (W.C. Polla's pseudonym), with its pronounced, essentially unsyncopated sound of dotted eighth notes alternating with sixteenths. (Bob noted here that it's almost impossible for the ear to distinguish between this sound and the use of triplet swing at a fast tempo; the fact that both figurations are used in this piece constitutes proof of a slow tempo being originally envisioned by the composer.) To complete his mini-tutorial, Bob then offered the opening theme of "Banjo" as it sounds from the version published in 1911. Issued in Cincinnati, the score is rife with swung rhythms which, by 1911, had gained much more widespread application than two years earlier. The craze, he said, was "cemented" by 1914 and the nearly universal dominance of the foxtrot, which is based on swung rhythm. Eric, noting that at the start of this year he had promised to perform all of Scott Joplin's published 1907 pieces, said that to date he had only performed three - "Gladiolus," "Rose Leaf" and "Search Light" rags. Of the remaining five, Eric said he did not have "Lily Queen" (cowritten with Arthur Marshall) or "When Your Hair is Like the Snow" (a maudlin song by Owen Spendthrift) memorized, but that today he'd do the remaining three. He began with Joplin's outstanding solo rag "The Nonpareil," issued by Stark in 1907 but generally regarded by music historians to have been written a year or two prior to Joplin's move to New York City that year. Shirley Case continued with more Eubie Blake - "The Chevy Chase" (1914) and "Tricky Fingers" (from around 1907 but unpublished until 1971), starting at a slower tempo to emphasize the latter's pretty A-theme melody and not speeding up until halfway through the piece. She closed her set with the pretty and justly famous British novelty tune "Marigold," the piece that helped make Billy Mayerl's reputation, sophisticated in almost every respect. Frank Sano gave us a 1920s "piano roll medley" that included "Ain't She Sweet," "Has Anybody Seen My Gal?," "Yes Sir, That's My Baby" and "Darkness on the Delta," then a second medley of "Doin' the Raccoon" and "The Girl Friend." Bill Mitchell opened his first set with Albert Gumble's "Bolo Rag," with its nice use of parallelism in the main theme. Bill noted that, in addition to much composing, Bolo was also an arranger for the likes of Percy Wenrich, George Botsford and other ragtime composers. Bill then moved on to 1910's "Georgia Rag," a peppy tune rarely played. Also rarely played is Lodge's great 1910 hit "Temptation," which Bill rendered nicely, giving the challenging piece a rousing, swinging finale. Ron Ross paid homage to two local ragtime clubs by playing Joplin's 1907 masterpiece "Rose Leaf Rag" (for Rose Leaf Ragtime Club) and (for OCRS) "Orange County Rag," also from '07 - 2007, that is. He closed his set with an original song, "The All-Inclusive Tour," about a hick guy who, with his "ma," goes to Vegas on a bus, the entire weekend costing just $80 per person. "Speaking of comedic songs," Eric said, St. Louis newspaperman Harry LaMertha wrote one 100 years ago called "Snoring Sampson," arranged for piano (and publication) by none other than Scott Joplin. Eric performed the piece on piano, sans lyrics, to give the audience an idea of how the rarely played piece sounds and promising to have a vocalist (most likely Erika C. Miller) on hand next time around, either at RagFest or a future OCRS. Next up, Vincent Johnson performed one of Eric's many originals - "An Autumn Memory," noting that it was apt considering autumn is just around the corner. "Plus," he said, the piece was written "the year before I was born" (1991). Stan Long then took the piano along with special guest Johnny May, one of Disneyland's many regular pianists. With Johnny taking the bass and most of the treble and Stan taking the extreme upper treble with his right hand, the duo rendered a rousing version of Joplin's "Peacherine Rag." They then switched places, with Stan taking over playing each piece "straight," with Johnny adding embellishments and piano-roll-style flourishes with both hands in the upper treble on "I Got Rhythm," "Maple Leaf Rag" and a raggedy, heavily syncopated version of "It's a Small World (After All)," including running through the piece in the minor key. In the unenviable position of having to follow this dynamic duo, Fred Hoeptner offered Joplin and Hayden's "Kismet" from 1913; Lamb's immortal "Ragtime Nightingale"; and Max Morath's contemporary masterpiece "One for Amelia," named for Lamb's second wife. Taking a cue, perhaps, from Vincent, Shirley offered up another Copeland tune, "Cabbage Leaf," rife with triplets and other examples of the eccentric composer's whimsical style. She then offered a second tune off her "Ragtime Feast" CD, "Moonshine Rag," a 1916 rag by St. Louis composer Edward Hudson, complete with walking bass, echo effect and other such devices. Taking their cue from Long and May, Frank and Bill gave us four-handed versions of "After You've Gone" and "The Blue Room." Bill then soloed on Scott's "Pegasus," his own "Musty" (a humorous hybrid of "Misty" and "Dusty Rag") and "Milenburg Joys," a rare Morton tune in which Bill added tasty breaks in the melody. On all three, Bill was accompanied by Andrew on washboard, who was given his own solo during a stoptime chorus. Eric delivered Joplin's "Euphonic Sounds," a 1909 showcase for some of his most daring concepts, then completed his trio of 1907 Joplins with a poetic rendering of the Chauvin collaboration "Heliotrope Bouquet." Vincent offered a very nice handling of Roberts' "Music Box Rag," inspired by Bill Mitchell's performance of the piece, then served up a tasty "French Pastry," the third Les Copeland rag of the afternoon. The 1914 rag has a funky A theme, bluesy/country-western B and a broad, gracious trio with breaks, a rolling/walking bass and, courtesy of the pianist, tangy tremolos. Andrew displayed the 1927 folio "Jazzapation," containing six "great pieces" by greats such as James P. Johnson, whose close friend, Perry Bradford, was a black New York City vaudevillian who published the folio. Andrew chose as one of the sextet Johnson's "Toddlin' Home," subtitled "Piano Stomp," a piece with a strong Harlem feel as well as traces of jazz and blues. Andrew's arrangement was inspired in part by JPJ's 1923 recording of the piece, plus a healthy dose of Andrew's individual touches. Returning to Charles B. Brown, Andrew selected 1911's "Apple Blossoms," with a pronounced classical bent, a strong period feel and a pretty, grand trio. He concluded with the Brown cakewalk "A Hot Old Time in Ragtown," from 1899. Noting that despite the piece's terrific title, the music itself "is not that hot," Andrew heated it up on the repeats of each theme, his performance rife with extra syncopations, swung rhythms, blues harmonies, drop bass, crash bass and other similar devices meant to lend excitement. That they did! Bob closed the afternoon with Spencer Williams' wonderful stride number "Shimmie-She-Wobble," noting that he had performed the piece at OCRS almost five years ago to the day, on September 14, 2002. Late in the piece, we hear a key change - a transposition that's part of Bob's arrangement (which was partly based, in turn, on the period orchestration recorded by the Heliotrope Ragtime Orchestra). Bob followed up with his 'realization' of Willie the Lion Smith's unpublished "Spanish Rag," a strong tango with a roaring A section, a more relaxed second theme with shifting harmonies, and a trio with an alluring call-and-response format. Our last OCRS of the year, this one featured a total of 45 selections by 11 musicians. 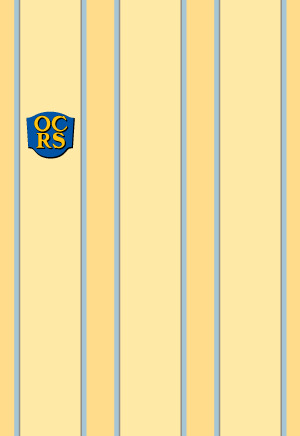 The 2008 OCRS schedule will be posted online soon, and we'll see everyone at RagFest 2007 and again next year at Steamers Jazz Club and Mo's Music!